Fr. 2175-A. 1996 $100 Federal Reserve Note. Boston. PCGS Currency Extremely Fine 45 PPQ. Printed Obstruction on Back.A stunning obstruction is observed on the back of this $100 FRN, with an impression of a paperclip observed above and to the left of Independence Hall. 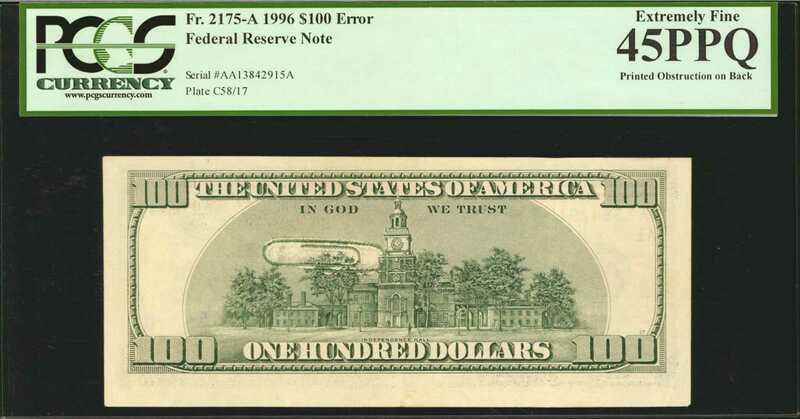 This error occurred when a paperclip was in between the sheet and the printing plate, and the pressure exerted during the pressing of the first print led to the paperclip laving an impression that we see on the reverse of this note, which partially bled through to the face of the note. A truly remarkable and impressive error, which is sure to grace any collection of error notes it enters. We anticipate spirited bidding from advanced error note collectors on this lot.